"Mommy, can I see that pencil?" "Mommy, what are you writing?" Without fail, every time I sit down to make my grocery list my boys want to get involved. They love to grocery shop with me and help pick out our food for the week, so why not let them pitch in when it comes to making the list as well? At age 3 1/2, they want to do everything for themselves, and they are at the perfect age to start learning about making healthy food choices. 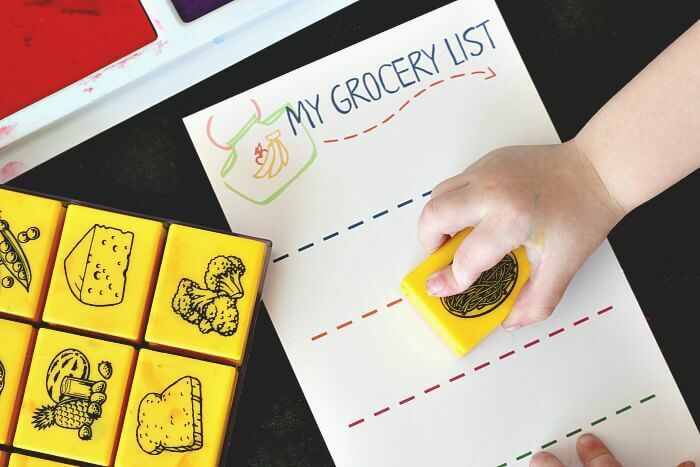 So I decided to make a grocery list activity that we can all do together - they can have some power over their food choices, practice identifying foods (and their corresponding colors), and as an added bonus it keeps them entertained when we go to the store! This grocery activity could not be easier to set up. 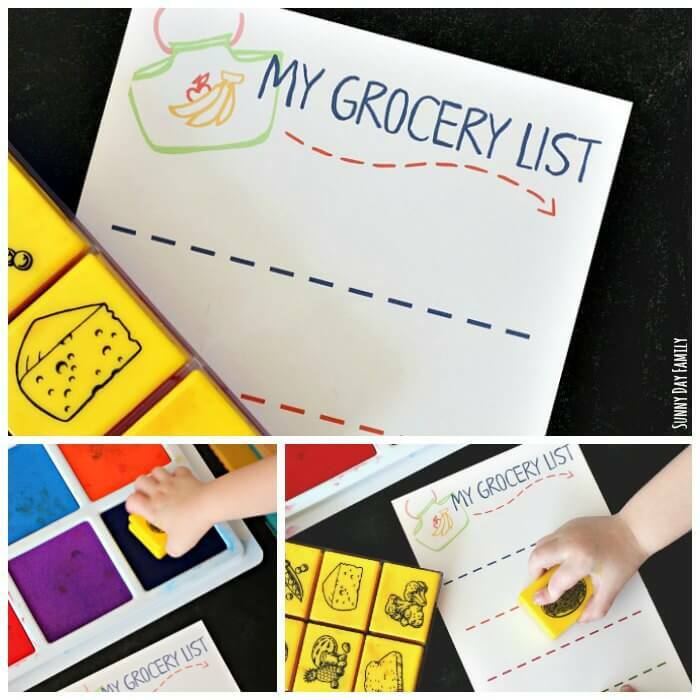 You can modify it for kids from preschool age on up, and depending on your child's age, it's a great way to practice food identification, matching colors of foods, drawing, or writing. It's also a wonderful tool to start a conversation on healthy eating and making healthy choices. Start with my free printable kids grocery list. It prints two to a page (perfect to go with mom's grocery list included in my free printable planner). Click the button below to get yours. 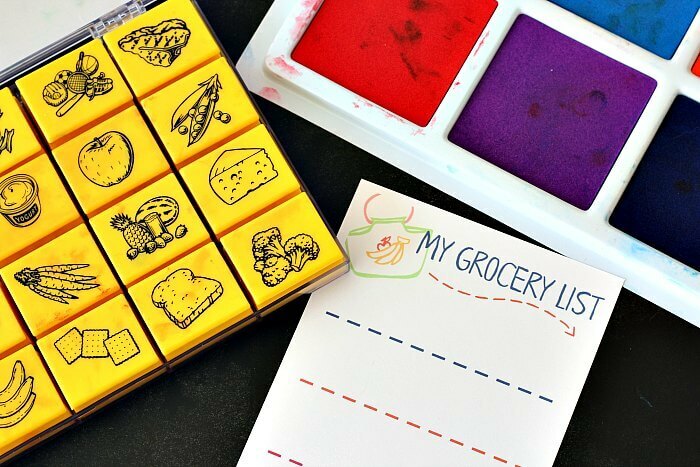 For my stamp-loving preschoolers, I set up the blank grocery list with this awesome set of healthy food stamps and our jumbo stamp pad. You could also use food stickers, crayons, or markers (or a combination of them all). Older kids can be encouraged to practice writing out their list. Once everything was set out, I invited the boys to help me make their own grocery list to go with mine. We talked about all the different foods, which ones they would like to find at the store, and what colors they should be. As they decided on foods that they liked, they added them to their lists! 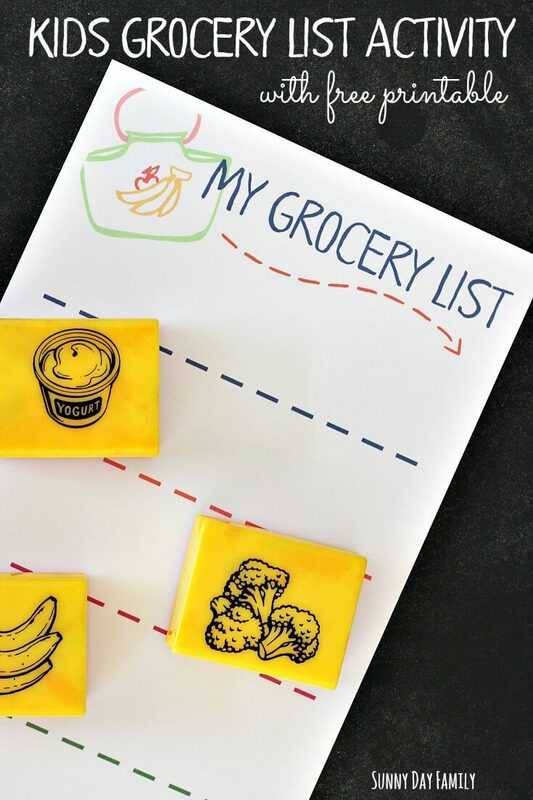 Once your list is complete, you can take it with you to the store for a really fun supermarket activity (and to help keep your kids entertained). They can help look for the items on their list and you can again open up a discussion on the wonderful colors and shapes of all the fresh fruits and vegetables, and how to make healthy food choices. Want more free printables to teach healthy eating? Click here to find 7 of my favorites!